Local to the San Francisco Bay Area? Email or phone for an appointment. Contact me before shipping your silver. Please follow these PDF Shipping Guidelines and fill out the Contact information form. The best option to get in touch is email. (If I am working, I may not answer the phone.) Email guarantees the quickest response. Please do not text images of your silver. Are you a human or robot? * Robot Human! This form will not allow you to attach images. Contact me via email to attach images in our email correspondence. If you can send a photo during our email correspondence, I will provide a guesstimate for repair. However, I may need to reevaluate the repair issues once I see the object in person. Sometimes underlying problems may not be easily visible until much closer inspection. Occasionally only after spending hours with your silver I made see undiagnosed issues. Therefore I reserve the right to adjust the repair estimate and will inform you by phone or email, waiting for your consent before initiating or continuing the repair. I strive to provide great service and top quality repairs while keeping expenses low, but keep in mind that each and every job is one-of-a-kind custom work done by hand. Top quality repair work on sterling and silver plate requires specialized skills and equipment along with years of experience. There is no such thing as "dipping" or assembly line manufacturing when doing silver repair and restoration. Examples of my artwork are featured in over 40 books including a whole chapter about my work in the book Manufractured: The Conspicuous Transformation of Everyday Objects, Makers: A History of American Studio Craft, and the cover of The Fine Art of The Tin Can. My metalsmithing skills started with my academic training. I have a B.F.A. 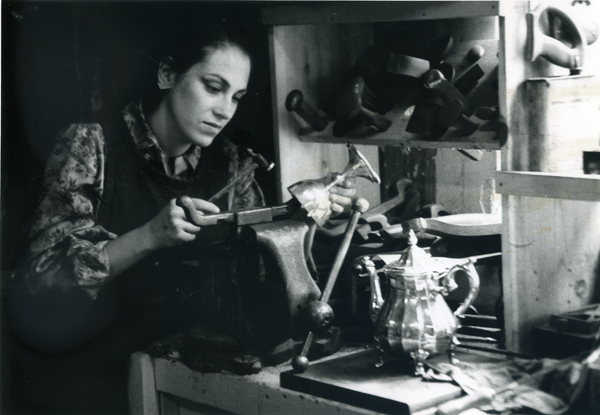 in Metalsmithing from Syracuse University, and a M.F.A. from Tyler School of Art, Temple University. Between undergraduate and graduate school I worked doing jewelry repair for years. After graduate school, I continued working in silver repair and restoration at Peninsula Plating for 8 years. The photo to the left is from this time period. In my artist’s life, I create Jewelry, Judacia and Sculpture which has been shown throughout the United States, Europe, and Africa. Since 1988 all my artwork uses post consumer, recycled materials to construct jewelry and teacups to large sculpture of social commentary. View art website for Harriete Estel Berman. My blog ASK HARRIETE regularly offers professional advice to the art community . Berman has written Professional Guidelines for the arts and crafts community with the guidance of artists, makers, gallery owners and collectors. The purpose of the Professional Guidelines is to promote understanding, checklists, and practical solutions for recurring issues in the art and craft community. The Professional Guidelines are available as downloadable PDF files. Berman’s volunteer activities include taking care of her neighborhood landscaping for 25 years, participation as a volunteer control subject in clinical research, and the SNAG Professional Development Seminar for nine years. I also lead five exercise classes per week.